Why Choose St. John Paull II? We teach students of all faiths and offer a warm and loving environment that nurtures the mind, body, and spirit of our students. The faculty, staff, and stakeholders of Saint John Paul II share the mission of dedication in forming the hearts and minds of our students according to the teachings of the Roman Catholic faith and with the highest standard of academic excellence. 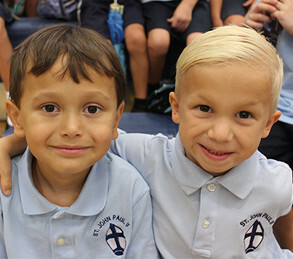 Saint John Paul II Catholic School provides a unique educational setting true to our Catholic identity and is designed to challenge and nurture students. We encourage every student and provide opportunities to become involved in a variety of school activities and programs. Activities range from middle school service projects to after-school clubs, sports, and other seasonal opportunities. Join us for a campus tour any Tuesday at 10:00 a.m., or call us for an appointment that better accommodates your schedule. We encourage prospective students to shadow a classroom in the morning or for a full day to assist with transitioning or the decision making process. Please call our office with any questions you have; we would be delighted to assist you as you prayerfully discern the best school for your family. We’re honored that you are considering SJPII for the education of your child. For specifics regarding our registration process and tuition schedule, visit our Registration page.